The inspiration for this harissa hummus came while I was devouring an amazing bowl of grilled harissa chicken tagine at Urban PL8 in Atlanta last May. A group of us had gathered there for dinner on the last night of BlogHer Food and everything they brought out was delicious. 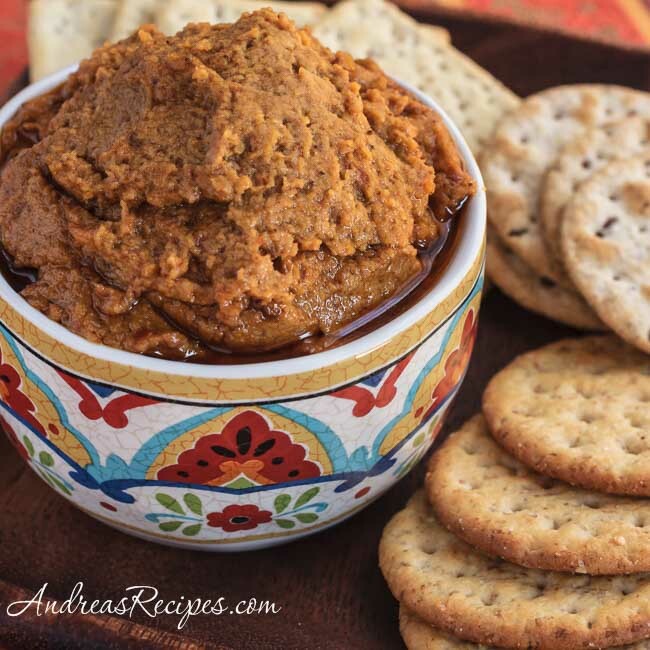 There’s something about the incredible flavor of harissa that keeps me coming back for more, and as I nibbled away I kept thinking about using harissa with hummus because it seemed like a perfect pairing of Middle Eastern and North African flavors. After I made the first batch, Michael was a changed man. My chipotle hummus had been his favorite, but this harissa hummus became his new favorite. 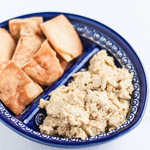 To make this hummus, you’ll need some harissa, either purchased or homemade. Making it is pretty easy, and you’ll have enough for about two batches of hummus. Harissa can be pretty strong, so if you aren’t used to it consider the 1/2 cup measurement a suggestion and start with a couple tablespoons and add to taste. 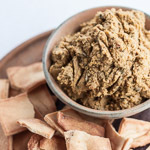 Like other kinds of hummus, this one makes a great snack or appetizer with vegetables and pita chips, and I like to use it as a condiment on pita sandwiches. That was a fun dinner! I’m sure the kick of harissa was a terrific addition to hummus. I need to see about this chipotle hummus, that sounds great too! Great color, too! I’ve been on a North-African – Middle-Eastern kick too — it all started with great hummus from a Syrian restaurant which opened nearby. 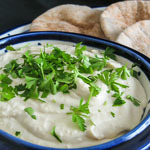 I love hummus, and this looks really enticing! I’ve never cooked with harissa before, but I’m fascinated by how hummus can be dressed up and flavored in so many creative ways. Kathy, yes it was! I have fond memories of that evening with you and the rest of the gals. Alanna, how lucky you are to have a Middle-Eastern restaurant nearby. I have to make do with what I fix at home. T.W., I think you would really enjoy the flavors in harissa. You should try it sometime! Um, YUM. And, coincidentally, I have all the ingredients for this right at home. In fact, I just cooked up some garbanzo beans the other day, so they’re ready to go! Whee!